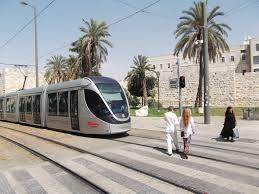 Occupied PalestIne, 1 September 2015 — The Boycott, Divestment and Sanctions (BDS) movement and its worldwide partners are celebrating the withdrawal of the huge French corporation Veolia from the Jerusalem Light Rail (JLR), an illegal rail system built to facilitate the growth and expansion of Israeli colonial settlements on occupied Palestinian territory. Veolia sold nearly all of its business operations in Israel in April 2015 but had until now remained a 5% shareholder in the JLR project. On Thursday evening, the human rights research group Who Profits reported that Veolia had liquidated its 5% share in the JLR project. Following Israel’s massacre in Gaza in the summer of 2014, for instance, Kuwait’s city council excluded Veolia from a tender for the treatment of solid waste worth $750 million. By the end of 2013, Veolia’s investment rating was reduced to “junk” status as a result of its reported massive debt of over $20 billion –almost equal to the total value of tenders lost by Veolia by then. The JLR is considered one of the most infamous colonial Israeli attempts to normalize and strengthen Israel’s hold on occupied East Jerusalem and tie the city’s settlements even more firmly into the state of Israel. The United Nations Human Rights Council considered the project a service to Israel’s illegal colonies in the OPT. Veolia’s involvement in it, among other similarly illegal Israeli operations, had rendered the company complicit in Israel’s violations of international law. The BDS campaign against Veolia was launched in Bilbao, the Basque region, in November 2008, to pressure the company to end its involvement in Israeli violations of Palestinian human rights. In 2007, French solidarity group AFPS and the Palestine Liberation Organization took the company to court in France to compel it to end its complicity in Israel’s violations of international law. 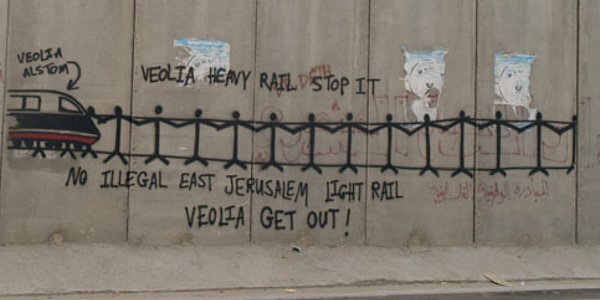 As well as its involvement in the JLR, Veolia had also been targeted for its role in waste, water and bus services for illegal Israeli settlements. Veolia transferred control of these projects to other companies as the campaign pressure on it mounted. Posted on September 19, 2015, in Uncategorized. Bookmark the permalink. Leave a comment.